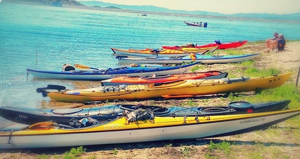 Valley Wide Kayak Club has monthly outings to various places and conducts a monthly kayak instruction & conditioning paddle. for consideration to be used as "picture of the month". Lake Perris - Sail Cove Conditioning Paddle - Sun. 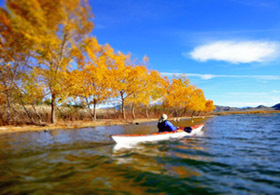 April 7 - 9 am launch at 9:30 am - Lake Perris is just beautiful after all the rain. It's hillsides are covered with wild flowers. Bring water, lunch, sunscreen and your kayak and gear. We'll paddle 6 miles around the lake and have lunch on the island. The Elkhorn Slough is one of California's largest wetlands and is part of a National Estuarine Research Reserve. Located at the heart of the Monterey Bay, it's a short trip from the Monterey Peninsula and the Santa Cruz area. The slough winds inland seven miles and provides vital feeding and resting grounds for a diverse population of wildlife. The weather is mild year-round, and each season offers unique opportunities for wildlife viewing.